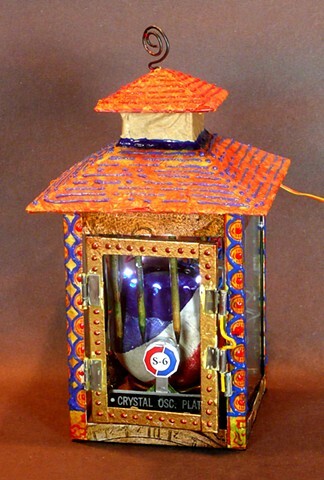 Created from a thrift shop lantern, this piece has a ring of LED lights that illuminate the red, white and blue (original color) croquet ball. Wooden spikes frame the ball. The red, white and blue pin is a security id from the McGovern campaign I was given to run the audio at the Davenport Hotel in 1972.